I am 6 months pregnant with my first child. We wanted to get in a last pampering trip before the baby came as well as before my travel was restricted. We also wanted to go somewhere where the flight wasn't going to be too long from where we live... Los Angeles. I wanted to lie on the beach, read and get massages, while my husband as an avid surfer wanted to find great waves. 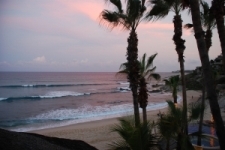 We settled on San Jose del Cabo, Mexico and we couldn't have chosen a better location. Our trip was 5 days, and we were accompanied by our closest friends. We spent the first three days at this small, very private hotel called the Cabo Surf Hotel. It is out of the way of the craziness of Cabo with it's own small private beach. We had a Junior Villa ocean front room that was wonderful. We slept with the doors open and had the sounds of the ocean in the background the whole time. Best part about it, they had two super fun waves for my husband right in front of the hotel. So while he surfed I lounged, ate and read. They have a small spa with almost every spa service you can think of. The staff is very nice, great food and close enough to downtown Cabo that you can go for a nice dinner within 20 minutes. We spent the last two days at the ME Cabo (Melia). We had a mixed experience at this hotel. We got an oceanfront room which was very nice. Spacious, clean, great big bathroom and tub. The pool area and beach is beautiful with beds you can spend the day lounging in. My only complaint is from about 2pm - 7pm they tried to make the pool area into a party zone and blared the most loud, horrible techno music. It also brought in a bit of the party crowd which we were not into. We had three wonderful dinners at restaurants throughout Cabo. We did sushi at Nick-San in the Palmilla resort. Beautiful restaurant, with great service and fresh sushi. We also had to have lobster at Lorenzillos which is right on the marina. Again, yummy food, great service and it was beautiful to sit outside overlooking the marina. You have to have the grilled lobster tail with butter if you go! My all time favorite meal was at an off the beaten path restaurant called Mi Casa. It's a bit out of the main downtown Cabo streets but still very accessible. The food was wonderful, the best fresh tortillas and guacamole! The decor is very charming!